Recently the micro cranking game have become ever popular in big cities. 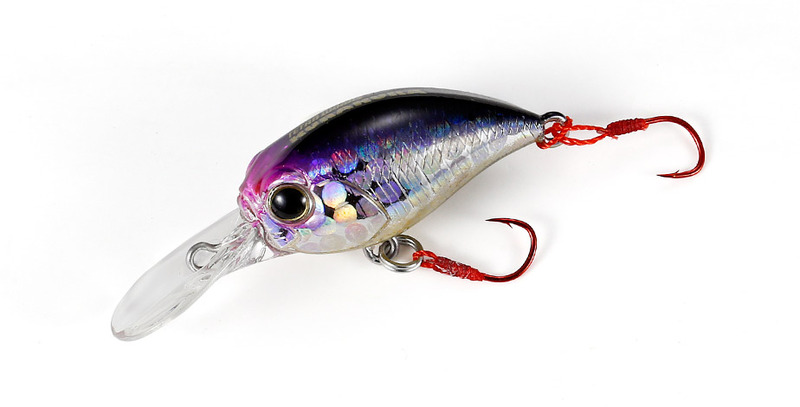 We have equipped this micro cranking lure with factors required to fish in estuaries with rough snags everywhere. Not only does this lure have a snag-less characteristics, it casts well and the response it has with its super thin lip creates high appeal at dead-slow retrieval.Anglers can utilize various techniques ranging from the bottom knocking, straight midrange retrieval and even the rising of the lure with it’s highly buoyant body. The choice of hooks were also a vital aspect of the development of the lure. It is not simply loaded with single hooks, but the use of flexible kevlar wire for the connection of the hooks has drastically improved the hookup rate. There is also a vast range of colors to choose from with the line up of natural chrome colors to the highly visible colors for the muddy water.